Working as a factual TV producer takes me to all sorts of weird and wonderful places. I’ve filmed off the coast of Namibia on a diamond mining ship. I’ve learned how they make pearls at an Australian pearl farm (you can read about that here). I’ve been inside a Polish apple juice factory, to an ice music festival (find out more here), and to the top of the construction site at Barcelona’s iconic cathedral, the Sagrada Familia. But these kinds of trips are the exception, rather than the rule. More often than not, my filming adventures are far less glamorous, and much closer to home. And so it was that I recently made my first visit to Canterbury, in the county of Kent in the South of England. It’s a pretty city and a popular tourist destination, so for those of you who are thinking about visiting, here is what I learned in the day and a half that I was in the area. 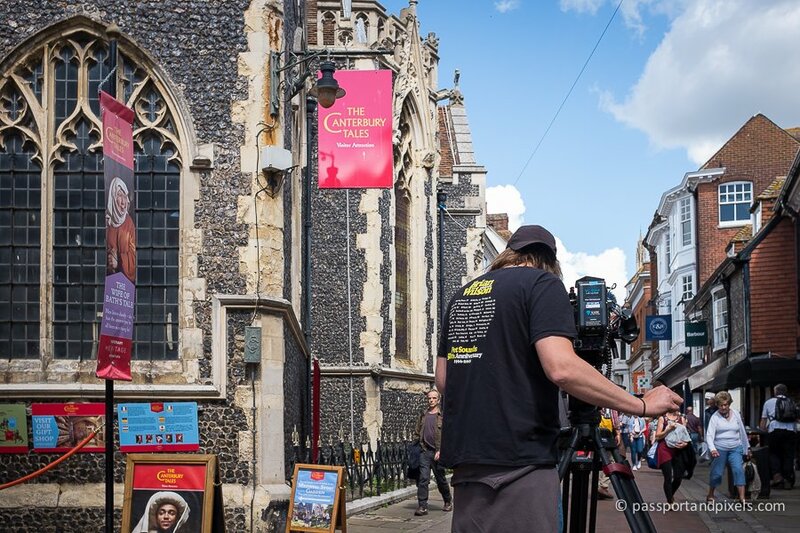 Please note that we were not there to film Canterbury itself, so my expertise on the subject is somewhat… um… limited. 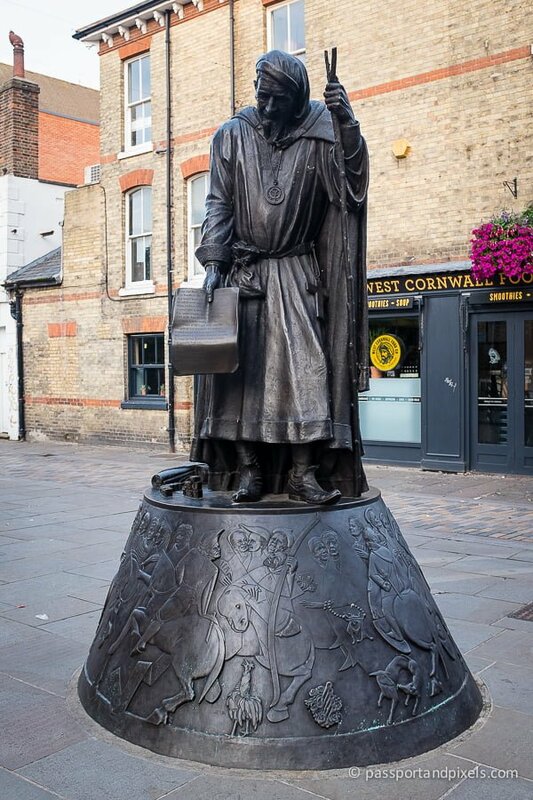 One of the main reasons why Canterbury is famous is because of a guy named Geoffrey Chaucer who lived in, like, the Olden Days or the Middle Ages or some time Yonks Ago, and wrote a bunch of stories called the Canterbury Tales which are considered by experts to be super significant in English Literature. 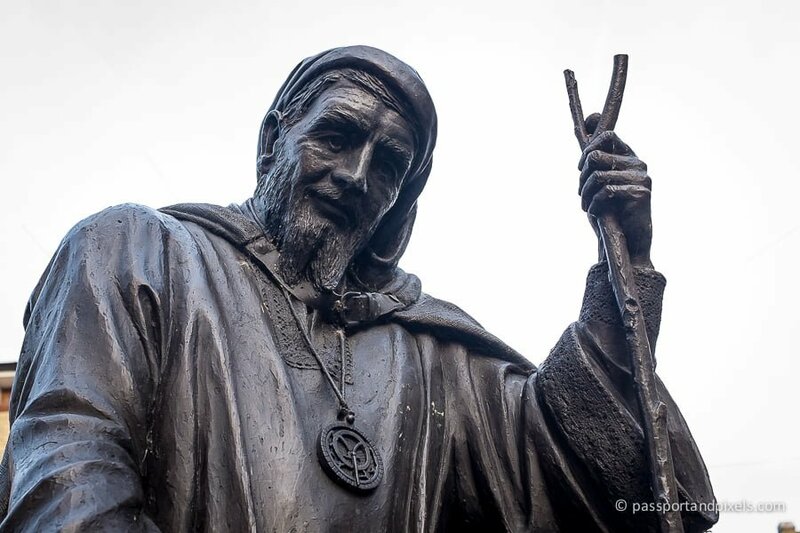 He’s so important that there is a statue of him in the middle of the city centre. I remember being forced to study the Tales in English class, and not understanding a bloody word because they are all written in oldy worldy English which no one speaks any more. But as I’m sure you know, the utterly useless stuff they made you learn at school still sticks with you, even when you can’t remember actual important things like where you put your keys. So I can still recite the first four lines of the General Prologue to the Canterbury Tales, even though this will never be useful to anyone, ever. As you can see, it’s a little challenging, to say the least. I only have a vague idea what it means, and no clue why it’s so important. But apparently it is, and as a result this guy is responsible for putting generations of schoolkids through hell. No wonder he looks so smug. 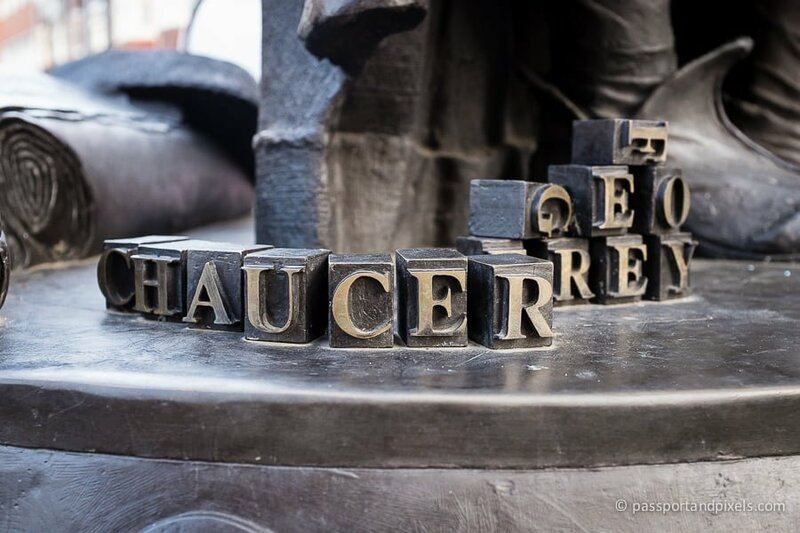 Apart from happening upon his statue as we walked through the city centre, I didn’t get to find out anything at all about Chaucer on my visit to Canterbury. 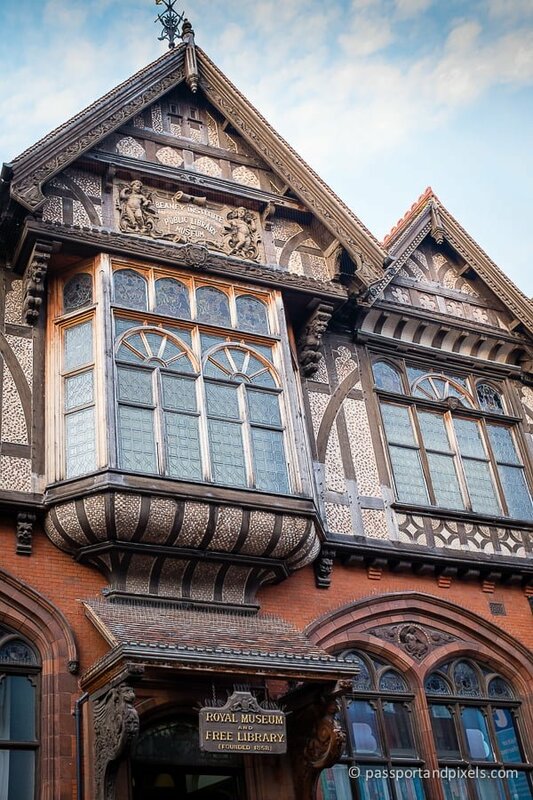 But if you’re interested, there is actually a Canterbury Tales museum, where you can no doubt learn everything you could possibly want to know (and plenty you don’t). Obviously we were working, so we didn’t have time to visit, but we did get a shot of the outside. Which is probably enough anyway, right? 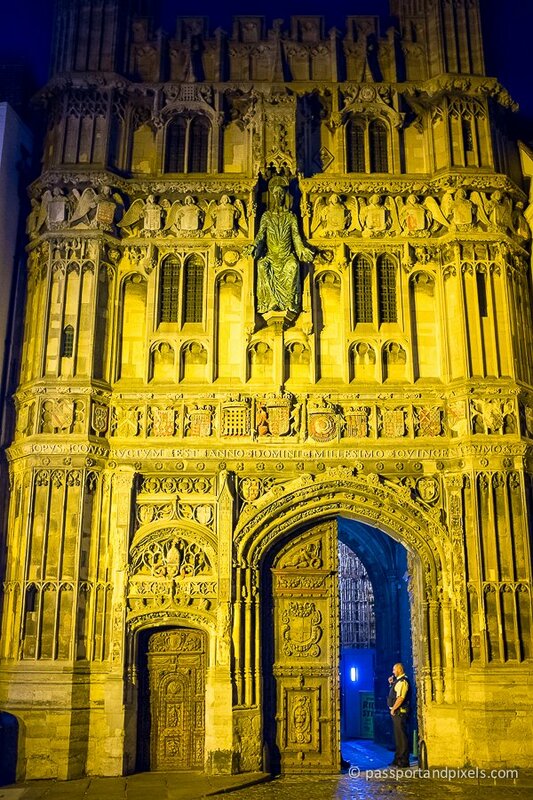 The second reason why Canterbury is a popular tourist destination (and a city, even though it’s quite small) is because it has a famous Cathedral. It’s the seat of the Archbishop of Canterbury, not to be confused with the Archbishop of Banterbury. The former is the leader of the Church of England. The latter is a slang term used to describe a particularly funny guy – though more often than not the person in question is actually just some cretinous youth who thinks getting tanked up on JD and coke and scoffing down a ‘cheeky Nando’s before vomiting into a drain is the epitome of a hilarious night out. 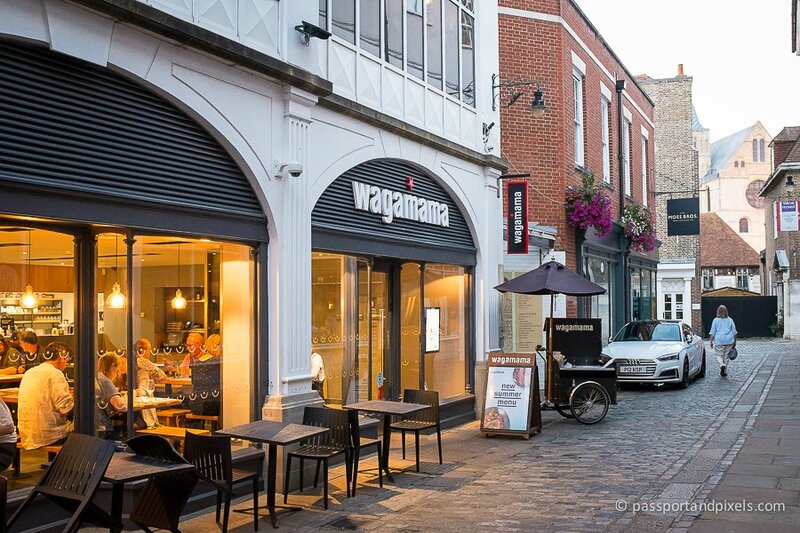 To be fair, you may spot both of these individuals in Canterbury if you keep your eyes peeled. Pretty much all tourists who visit Canterbury go to visit the Cathedral, which is apparently very pretty and historic. Since I was there for work, and not as a tourist, I did not, so I cannot tell you if it’s worth the trouble. However, I did get this glimpse of it, swathed in scaffolding, from across the back of a car park. I think the row of bins really adds to the charm, don’t you? A little later that evening we passed closer by the Cathedral. This is, I think, the main gate. It looks pretty main, anyway, and it’s a gate, and the building next door was called the Cathedral Gate Hotel, so this seems to be the likely conclusion. I bet you’re impressed with my detective work. Sadly, however, since it was late, the place was shut so we couldn’t go in. I toyed with the idea of marching up to the security guard and saying ‘Let me in, please, I’m an important TV producer!’ but I didn’t want to get arrested. Note: we did not see the Archbishop. Or the other Archbishop. Filming budgets being what they are, we did not have the expenses allowance for me to be able to try out any of Canterbury’s nice restaurants. 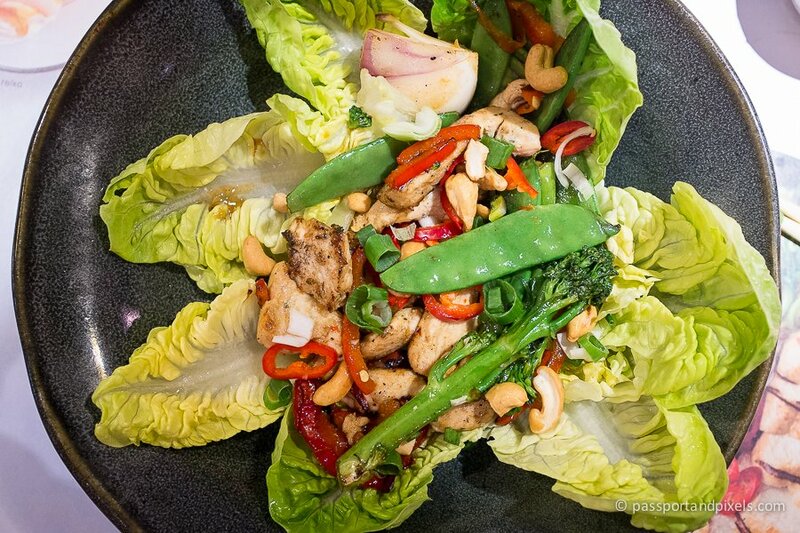 Instead we went to Wagamama where, since I was trying to be healthy, I had a warm chicken salad thing. To be frank, it was a poor choice. Although it tasted nice, it was pretty small and underwhelming. I should have had something with fried noodles instead. If you want Asian food, you’re probably better off trying Happy Samurai. We stumbled across this place while filming the next day, and went there for a quick lunch (the presenter just LOVES ramen and gyoza). We got lucky. 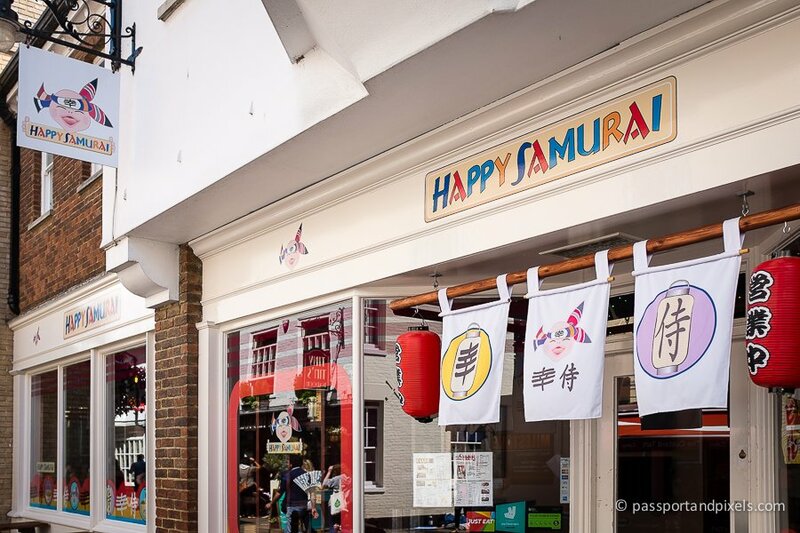 Happy Samurai is a family-run business doing authentic Japanese cuisine in a quirky setting, and the food was fast and good (just what you need when you’re on a packed filming schedule). 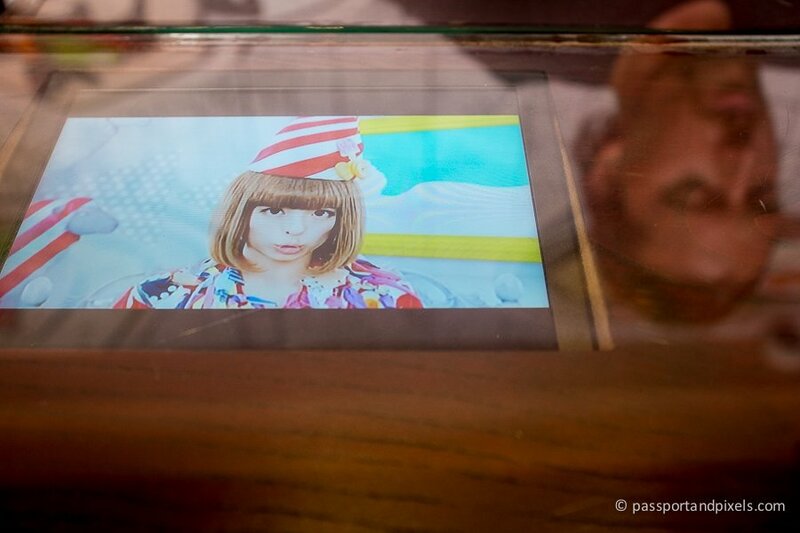 They even have TV screens set into the tables, so you can watch weird psychedelic Japanese TV shows with the sound off while you’re waiting for your order to arrive. ‘But what about drinking?’ I hear you cry. 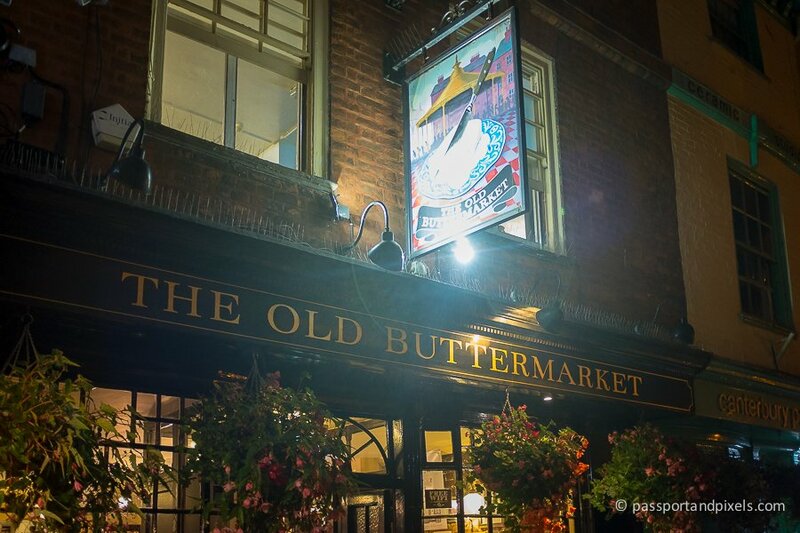 ‘After all that culture and excitement I’m going to need a drink!’ Well since we were staying the night in the centre of Canterbury, we did actually have time to visit just one pub: the Old Buttermarket, right by the Cathedral Gate. 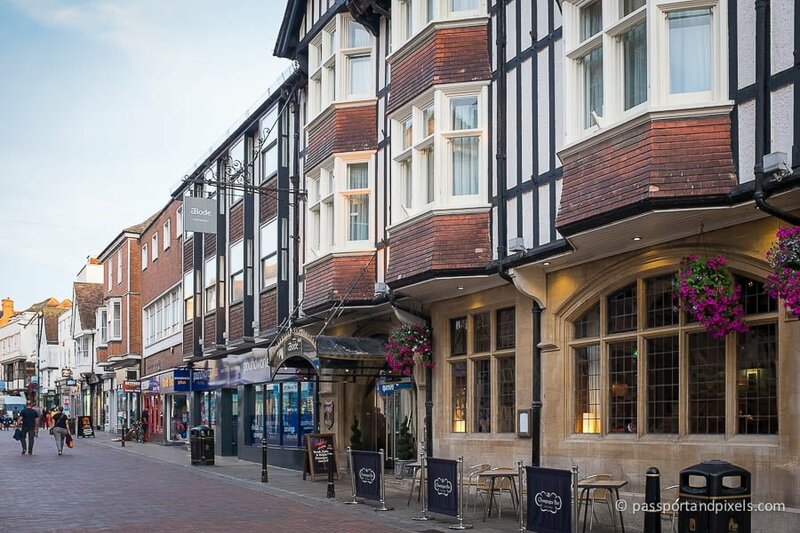 It’s part of the pretty average Nicholson’s chain of pubs, but it was pleasant enough: very central, in a nice historic building, and with a slightly tired old pub feel to it. If you’re a foreign visitor, you will probably love it because it is ‘typical’ and ‘British’ and it has free wifi so you can take photos of your fish & chips and immediately put them on Instagram to wow your friends and family back home. However for me the most entertaining thing about the pub was two girls sitting by the window, not talking to each other, just pouting and taking selfies. I can’t promise they will still be there when you visit. After our one drink, we went back to the hotel, because we had to get up early for filming the next day. 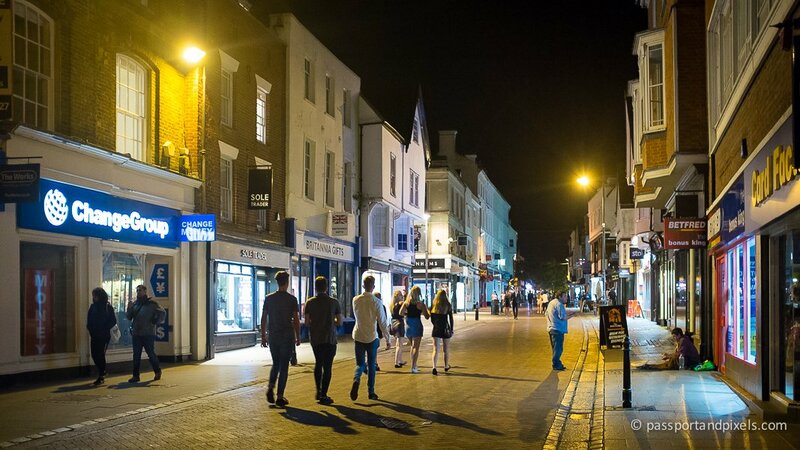 If you don’t, there is probably more wild nightlife to be had in the city – or at least it seems that way, because the street was pretty busy with young guys and girls, dressed in their finest short skirts and skinny jeans, heading off somewhere. I wonder if one of these chaps is the Archbishop of Banterbury? Every good tourist destination guide should have a section about shopping. This is obviously not a good guide, but I thought I’d put one in anyway. Gotta have goals, right? 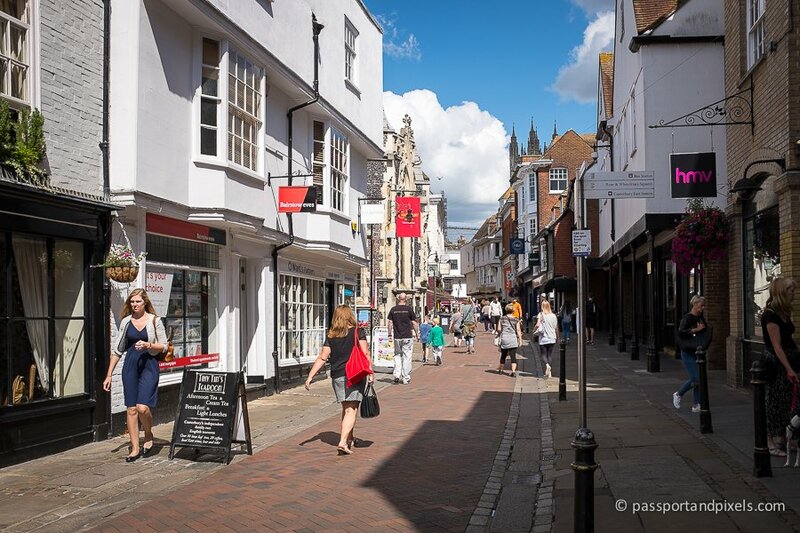 This appears to be one of Canterbury’s main shopping streets. Isn’t it nice? Clean, no traffic, with an HMV for all your film and music needs and an estate agent if you’re thinking of moving to the town. Normally while filming I wouldn’t get the chance to go into any shops, but on this occasion I got a rare treat. We were grabbing a few shots of the area, and the presenter disappeared, so I phoned his mobile to find out where he’d gone. It turned out he’d just nipped into the Barbour store, so I went there to drag him out. He was spontaneously buying a hat, as you do. It seemed like a nice enough shop, if you’re into that quintessential country British style. Of course I didn’t buy anything, and ended up carrying the damn hat for the whole of the rest of the day. It’s not a coincidence that Kent, the county in which Canterbury is situated, is sometimes known as ‘The Garden of England’. 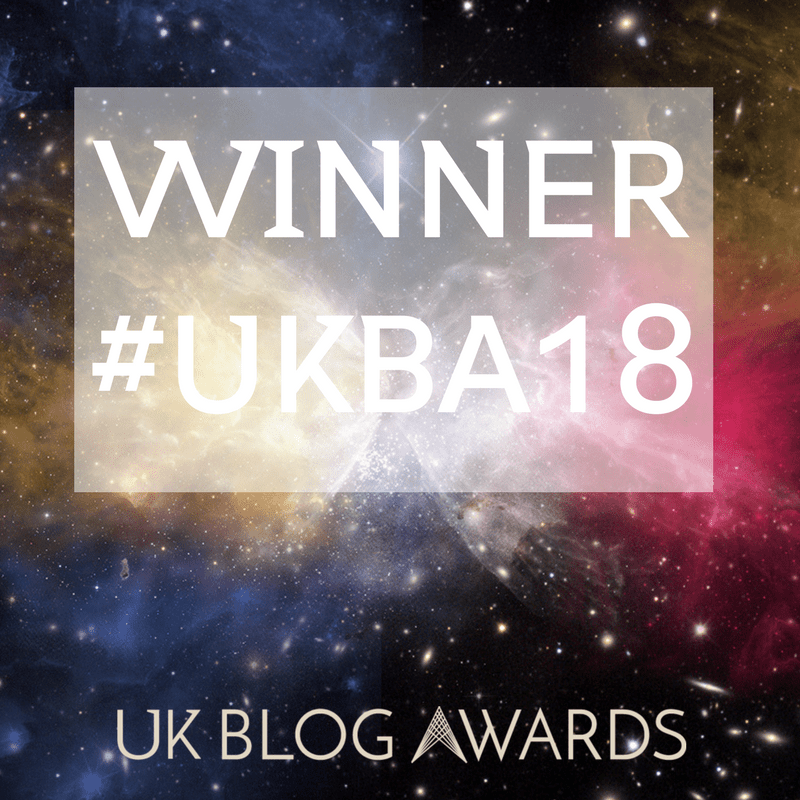 It’s pretty flat, and is full of farms and market gardens, the produce from which may well end up back in the supermarkets and eating establishments of Canterbury itself. 1. 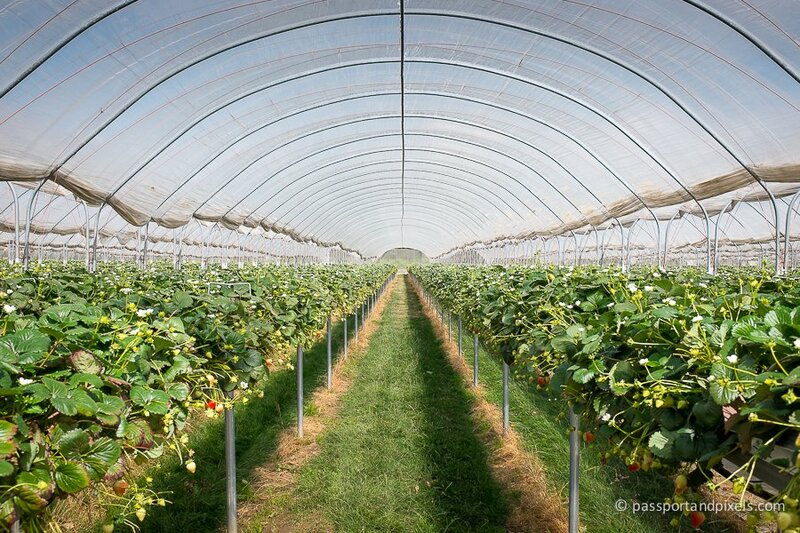 Most strawberries in the UK are grown in polytunnels, like this one. I’d never been inside a polytunnel before. It was basically like a giant greenhouse and it was quite useful because at one point while we were filming it started to rain, and we didn’t get wet. 2. 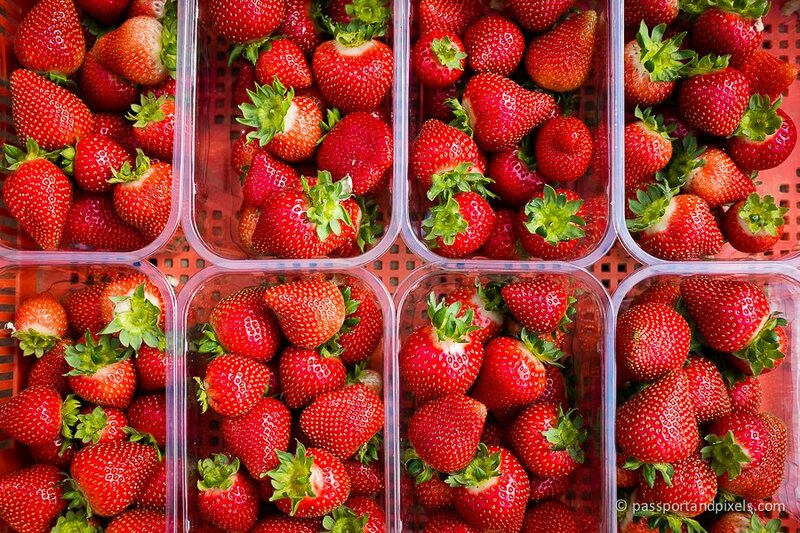 The price of strawberries in the UK has stayed the same for the last 20 years. That’s not a typo. A punnet of strawberries has remained at around the £2 mark for over two decades! 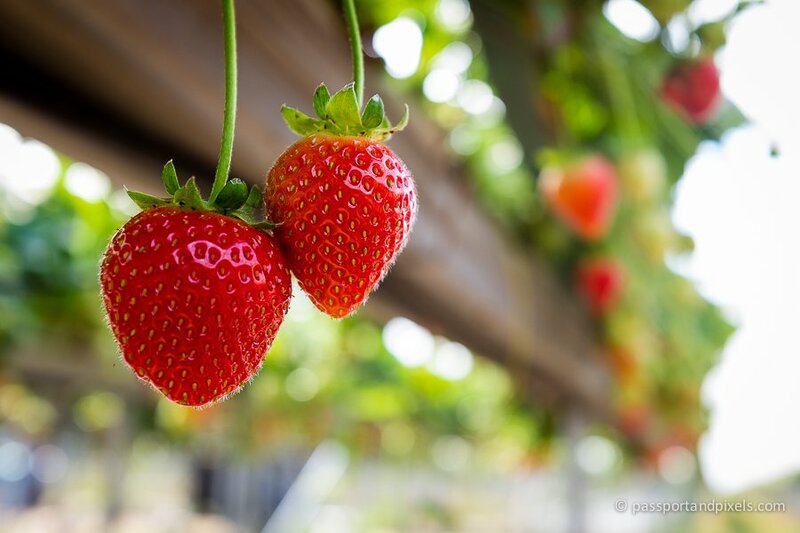 That’s because in that time farmers have found loads of clever ways to increase production, such as growing the strawberries on these special waist-high tables to make them easier to pick, and developing special, higher-yield varieties. And don’t they look delicious and juicy? (The farmer gave us a punnet, and I can confirm that indeed they were). 3. Strawberries are still picked by hand. 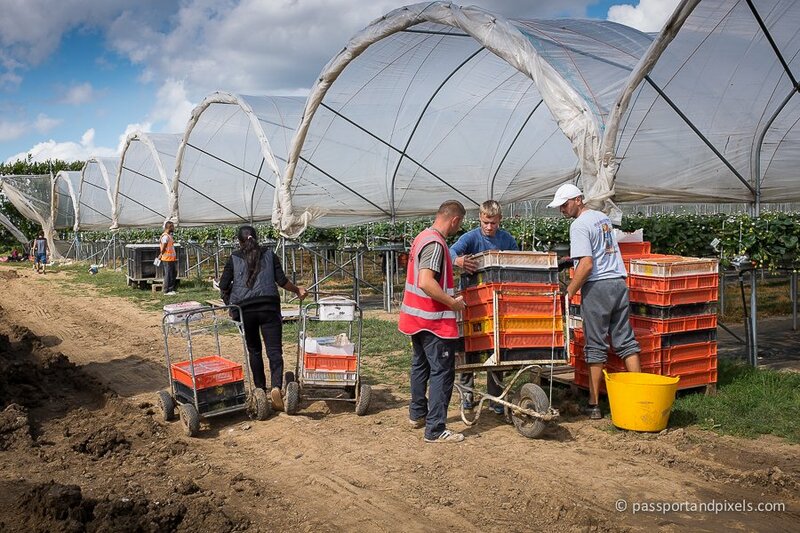 Mostly by Eastern European seasonal workers pushing little carts loaded with orange plastic trays. 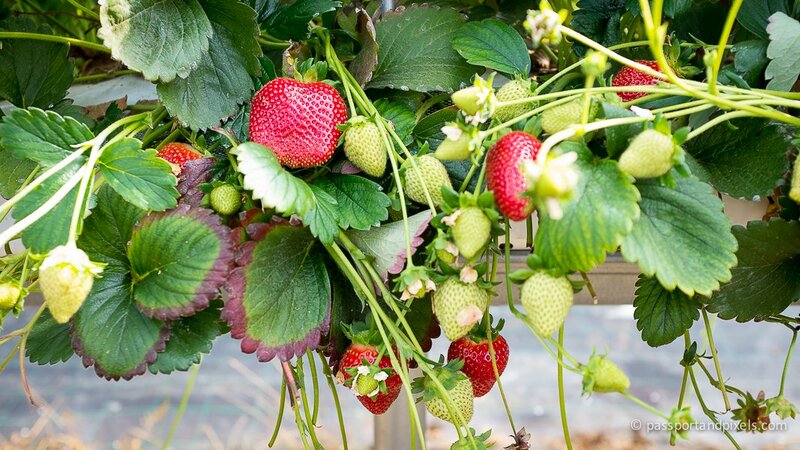 There’s a special knack involving holding the strawberry very gently between thumb and forefingers and then twisting it upwards so the stem snaps – which is not as easy as it sounds. Happily if you mess it up then it means you get to eat the strawberry (or at least, that’s what I took it to mean). However clever science bods are currently developing robot strawberry pickers, which may take over in the future. They don’t mess it up, and won’t eat any of the produce. They may soon learn to use that twisting and snapping technique on us humans when they rise up and take over, but I wouldn’t worry about that for now. 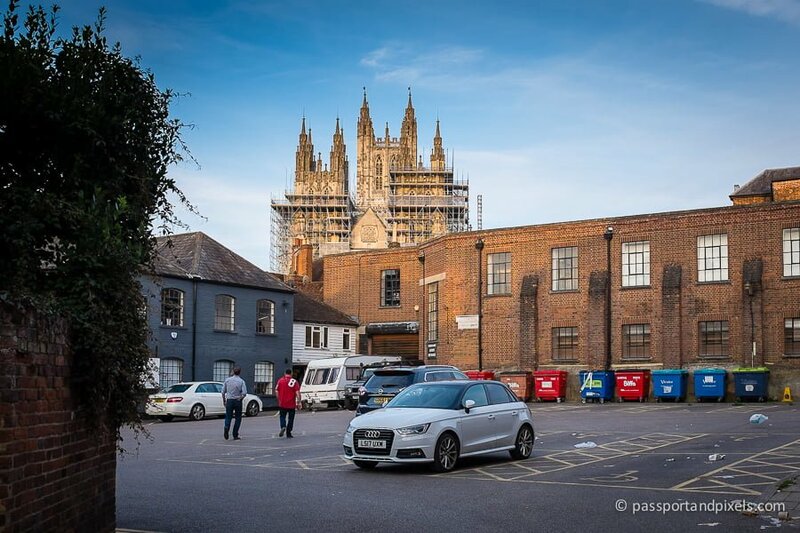 Obviously if you go to visit Canterbury you won’t get to visit a strawberry farm, but you may eat some strawberries, so hopefully you found this last part interesting, if not particularly helpful.